The Indian School of Business has released the 2014 ranking of India’s largest transnational corporations based on the Transnationality Index (TNI). Professor Raveendra Chittoor and Bibhu Prasad Kar present the results providing new insights into the nature of internationalisation of the companies. The Indian School of Business (ISB) conducts an annual survey, based on which it comes out with a list of India’s largest Transnational Corporations (TNCs) every year. This is a first-of-its-kind ranking in India started by the ISB in the year 2012 using a globally accepted measure known as the Transnationality Index (TNI). The TNI allows a proper comparison of Indian TNCs with each other as well as with global players. Indian transnational corporations now constitute a significant proportion of global corporations. The Fortune 2013 Global 500 list features 119 companies from developing economies, an increase of about six times since 2000 and up from 112 last year (Fortune, 2013). India and Brazil rank second in terms of the number of the Fortune Global 500 companies headquartered in them (eight each), after China and Taiwan combined (95) (Global Times, 2013). Despite the rise of TNCs from India, until the initiative by ISB in 2012, no systematic attempt was made to rank Indian transnationals. We have tried to expand the list of participating companies this year, but challenges remain in convincing companies to share data for research. We have expanded the ranking to the top 20 transnational corporations this year (from 15 last year). We have presented the rankings not only based on the TNI, but also based on the size of foreign assets and foreign revenues. Finally, we have incorporated additional insights into the nature of the companies’ internationalisation this year including their geographical spread. Emerging Market Economies (EMEs) have become an important source of foreign investment for the rest of the world. Firms from developing countries have proved to be very competitive in the last decade and both private-sector and state-owned enterprises from these economies are expanding beyond the boundaries of their home country. The aggregate global FDI outflows (OFDI) had increased to US$14.5 trillion in 2010 (an increase of 31% over 2009) and then to US$16.2 trillion in 2011 (an increase of 12% over 2010). Global OFDI dipped by 12% to US$14.2 trillion in 2012 and further by 2% in 2013 to US$ 13.9 trillion. The aggregate OFDI trends from India were similar to global trends. 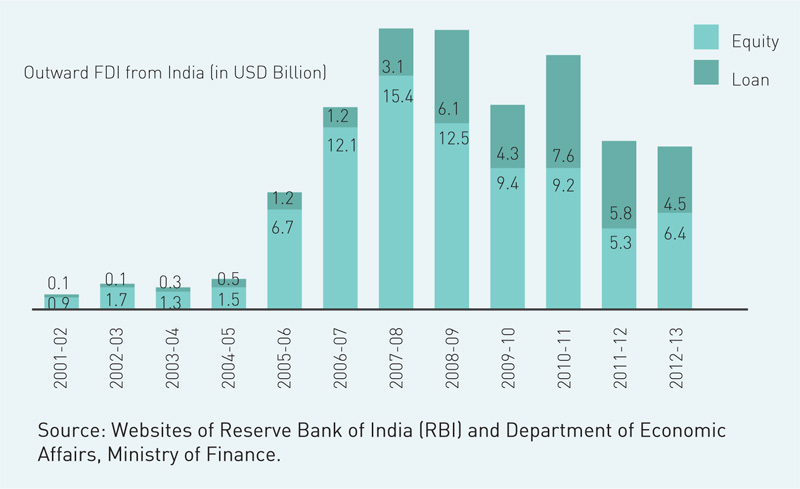 Financial year (FY) 2013 saw a drop in overseas investments by Indian companies (Figure 1). 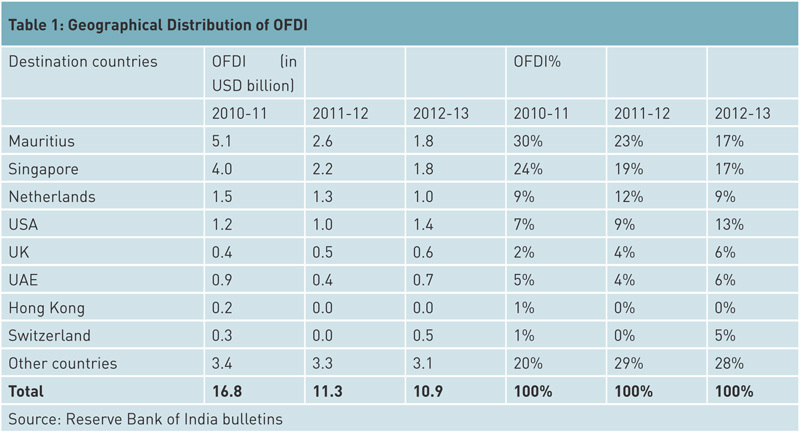 OFDI fell by 1.8% from US$11.1 billion in 2011-12 to US$10.9 billion in 2012-13. However, India’s largest and most internationalised companies continued their international expansion, with their foreign sales, assets and employment growing significantly faster than other companies. The group of 20 companies featured in our ranking collectively increased their foreign revenues by 16%, foreign assets by 11% and foreign employees count by 7% – a noteworthy fact considering that FY2013 was not a good year for the overall investment climate..
Indian companies are globalising into newer geographies. Until around 2000, their focus for overseas expansion was primarily other developing countries with similar institutional environment and low technology competition. However, investment trends suggest that over the last decade, overseas investments have been flowing towards developed countries as well (Table 1). Indian companies seem to be driven by the need to have access not only to the lucrative consumer markets of developed countries for their products but also to their sophisticated technologies and knowledge assets. The average of these three measures reflects the TNI of the firm. The multidimensionality of the index accounts for the variation in the three indicators across different sectors. For example, the services sector is likely to have a larger proportion of international employees but a smaller proportion of international assets – the opposite of manufacturing firms. In India, it is not possible to calculate the TNI and rank companies using secondary data alone, as some of the data required to calculate the TNI is not publicly disclosed by firms. For example, the number of international employees or the size of the foreign assets cannot be obtained from public sources for all firms. Thus, our study incorporates a mix of primary and secondary research to collect data and arrive at the rankings. We used secondary data from Prowess, a publicly available database maintained by the Centre for Monitoring Indian Economy (CMIE). Prowess includes information sourced from the financial reports of companies in India from 1989 onwards. We excluded all banking and financial services companies from our study, as their financial assets are often not comparable with the assets of other sectors such as manufacturing and non-financial services. The “Investment outside India”1 indicator in Prowess helped us identify an initial set of 500 potential companies (with the largest ‘Investments outside India’) for the study. This indicator, however, only lists non-consolidated data; therefore, we needed to vet actual consolidated assets through other secondary sources. We used Standard & Poor’s Capital IQ database to track consolidated overseas assets and consolidated overseas revenues. We also referred to the annual reports of publicly listed companies to track these indicators. Thus, we eliminated firms which had a minimal presence outside India (in terms of assets). We then shortlisted 50 companies, those with high proportions of international revenues and international assets, and contacted these companies for further information. We prepared a questionnaire for the 50 companies on our list. This questionnaire focused on the firm’s international activities. The firms were asked to provide us with ratios of international revenues, assets and employees to total revenues, assets and employees respectively. They were also asked to provide the regional breakup (split into North America, Europe and others) of their international revenues, assets and employees. We then contacted the senior leadership of the 50 companies and asked them to respond to our questionnaire. Of the 50 companies we contacted, 29 companies responded to our questionnaire. We expect the response rate to improve over the next few years as companies become more familiar with the survey and with the concept of the TNI. We are also considering of publishing the full list of companies surveyed and their ranking next year instead of ranking only the largest 20 as we did this year, as this may encourage their participation in the study. We validated the data collected through primary research using secondary data and created a composite TNI ranking based on the available data. Based on the responses received, we ranked all companies based on their TNI. As we were interested in identifying India’s largest and most global transnational corporations, we ranked those companies with international assets of at least US$250 million in FY2013. 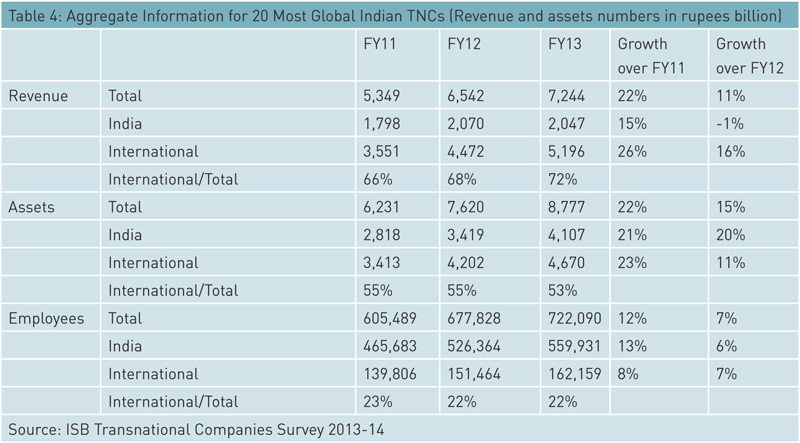 Table 2 lists the top 20 TNCs with international assets greater than US$250 million. In the current year’s rankings, the state-owned company ONGC Videsh Ltd. has continued to maintain its first position as India’s most internationalised large corporation though its TNI has slipped by a percentage point to 94% compared to the previous year. ONGC Videsh is “the international petroleum company of India”, that aims to prospect for oil and gas acreages abroad, which includes acquisition of oil and gas fields in foreign countries as well as exploration, production, transportation and sale of oil and gas. Core Education & Technologies Ltd. showed a sharp increase in the size of foreign assets to be listed among the large companies this year in the second spot in terms of TNI. Core Education & Technologies is a global education company founded just about a decade ago in 2003 by Sanjeev Mansotra. Today, a decade after it began its operations, it has presence in 14 countries, earns more than 89% of its revenue from international operations and has more than 78% of its assets located abroad. Both Tata Global Beverages Ltd. (ranked three) and Suzlon Energy Ltd. (ranked four) showed a sharp increase of over ten percentage points in TNI compared to last year. Tata Global Beverages is one of the few companies in the list with a high foreign component of seventy percent in all the three dimensions – assets, revenues and people. In terms of cumulative installed capacity and market share, Suzlon Energy was ranked world’s fifth largest wind turbine supplier at the end of 2013. The company has global presence extending across North America, South America, Europe, Africa, Asia and Australia with over 24,000 MW of wind energy capacity installed. It has operations across over 30 countries and employee headcount over 10,000. Piramal Enterprises Ltd., ranked 17, has shown the highest jump in TNI of 15% over the last year. Piramal Enterprises has been executing an overall strategy to diversify from the pharmaceutical business and establish a significant presence in the fast growing sectors of information management and financial services. In 2012-13, Piramal had acquired Decision Resources Group, an information management firm dealing in big data and analytics for US$ 635 million. This overseas acquisition was the key driver behind the steep increase in TNI witnessed by Piramal Enterprises this year. The Top 12 companies in Table 2 have a TNI of 50% or more, which is comparable to that of the top transnational corporations from the developed countries. The majority of the companies on our list are affiliated to business groups – a phenomenon unique to emerging economies – with companies from the Tata group dominating the list. Traditionally, transnational corporations have also been ranked based on the size of their foreign assets. 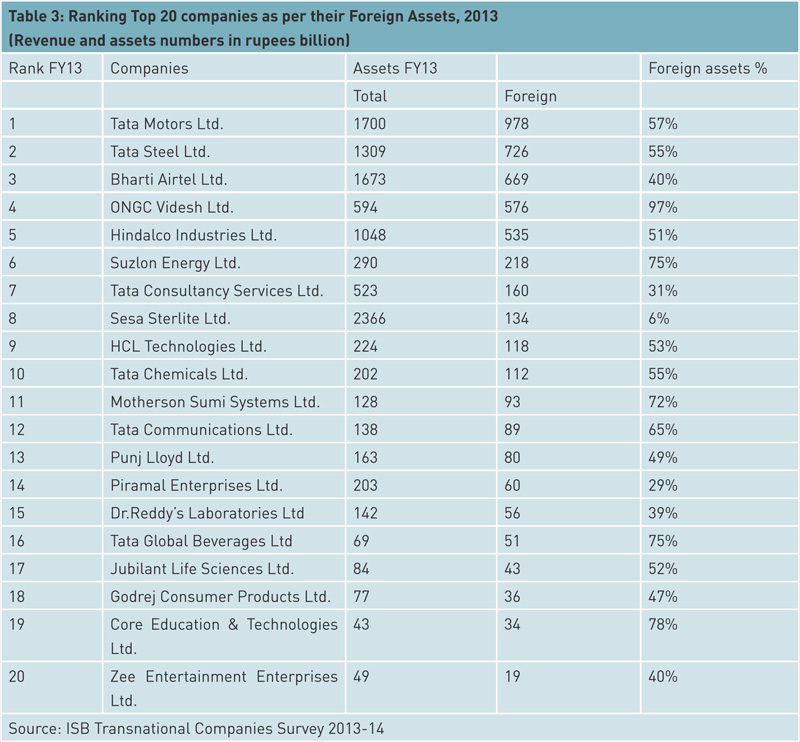 Therefore, we also list below the 20 largest Indian TNCs ranked in terms of their assets overseas. 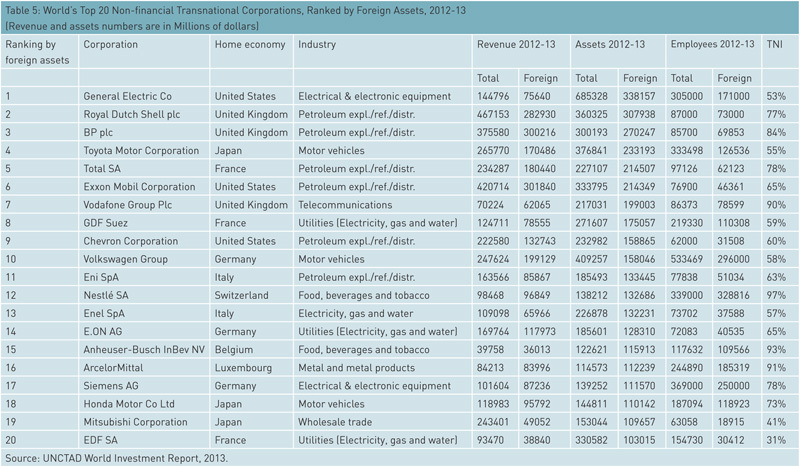 The foreign assets of all the companies listed in Table 3 add up to a total of about (Rs. 4788 billion), with the top 5 contributing to 73% of the total. 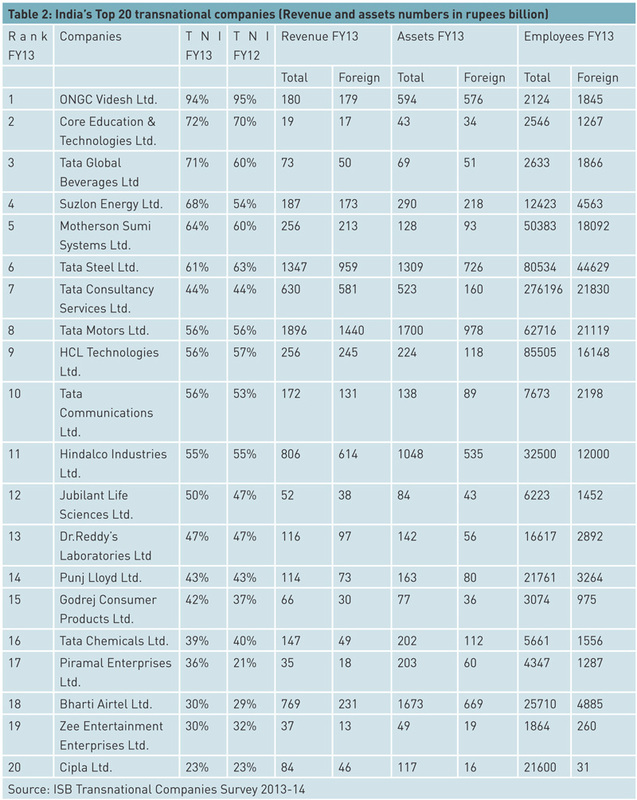 More than half the firms in the ranking are affiliated to business groups, six of which are owned by the Tata group. ONGC Videsh is the only public sector company to figure in this ranking. Mostly manufacturing firms dominate the list of largest TNCs. Three services companies figure in the Top 10 in this list. The top 20 TNCs with assets of US$250 million or more earned 72% of their total revenues from international operations, held 53% of their total assets overseas, and employed 22% of their total workforce abroad (Table 4). Further, our analysis suggests that India’s top TNCs have a balanced presence in both developed and developing markets. This finding is in line with some of the recent international business literature, which asserts that emerging market multinational companies do not necessarily have a preference for expanding into the culturally closer and low technology markets of developing countries. The top 20 Indian TNCs on an average earned 39% of their total revenues and held 25% of their total assets in the developed markets of North America and Europe in 2012-13. How do India’s top TNCs fare when compared with the world’s largest TNCs? We can compare the above list of largest Indian TNCs with the world majors as the same underlying measure, i.e., the transnationality index (TNI), is also used by UNCTAD to rank the world’s 100 largest non-financial TNCs (UNCTAD, 2013). The world’s top 100 non-financial TNCs, in aggregate, earned 65% of their revenues, owned 60% of their assets and employed 58% of their employees outside of their home country in 2012-13. The proportion of international assets and revenues of top Indian TNCs is somewhat comparable to that of top global TNCs, but Indian companies lag behind significantly when it comes to employing a global workforce. This gap is reducing gradually (evidenced by Table 2) as India becomes more integrated with the rest of the world and as the Indian TNCs become truly global. Table 5 provides a list of top global non-financial TNCs ranked by foreign assets. Over the last decade, the engagement of Indian companies with overseas markets has undergone a complete transformation. 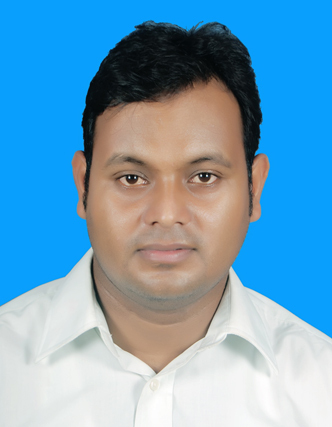 India has gradually become more integrated with the global economy and Indian companies are emerging as important players on the global landscape. Indian transnational corporations have significantly increased their international asset base as well as their international revenues over the past decade. Despite the general dip in aggregate overseas FDI in 2013 (globally as well as for India), the top Indian TNCs continued their aggressive globalisation march by showing double digit growth in international revenue, assets and employees. We anticipate that the extent of globalisation will only increase further as India becomes more integrated with the rest of the global economy and as Indian companies gain more confidence by acquiring experience in overseas markets. Our study has been the first and still possibly the only systematic attempt to rank Indian transnational corporations based on the TNI. We improved on last year’s survey by expanding the number of participating companies, and hope to continue this over the years. This study facilitates comparison and benchmarking of the top Indian TNCs among themselves and with the top TNCs in the world. Note: This study, third in a series started in 2012, was conducted by Professor Raveendra Chittoor with assistance from Bibhu Prasad Kar, Research Associate at the ISB. Previous studies and rankings have appeared in the July-September 2013 and April-June 2012 issues of ISBInsight. 1The ‘Investments outside India’ field captures the total value of cumulative investments made by the company outside India. The overseas investments could be in equity shares, preference shares, debt instruments, mutual funds, or other investments such as in immovable properties, capital of partnership firms, etc. They could be for long-term or short-term purposes. 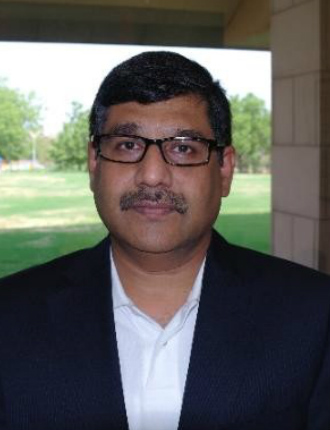 Research Associate with the Faculty and Research Department at the Indian School of Business (ISB).